Kochi has a lot of natural places. About 80% of the prefecture is mountainous. These areas have a lot of mountain streams. and Japanese giant salamanders live there. Their figure and color give them a strange appearance. The appearances has not changed for nearly 30,000,000 years. The Japanese giant salamander’s individual size is 50 to 100cm. The largest size discovered was 150cm, making it the largest in amphibian. The surface of the body is somber and has a lot of small black spots and a lot of small warts. They lie in a hole in day and move at night. The lairs are made at edges of river banks where they prey upon fish, frogs, crustaceans, shellfish and angleworms. They are oviparous and lay 300~600 eggs like a rosary. The eggs are laid in a lair that a male makes or a natural hole. The eggs can hatch if they have passed for 50 days. A male protects his eggs until they hatching. They are classified Amphibia, Caudata, Cryptobranchoidae, Andriasand, A.japonicus. The Chinese giant salamander has a close blood relationship with the Japanese giant salamander. But Chinese giant salamander does not have a lot of small warts. The point differs from the Japanese giant salamander. Japanese giant salamanders like clean water so they live in the upper of river in Japan. Though they are rare, we can sometimes see the Japanese giant salamander along the rivers of Kochi, for example the Niyodo river system. Occasionally in the lower reaches. We can catch and eat Japanese giant salamander, but we should not do it. The reason is that they are appointed a natural monument and are classified in the Red Data Book as rare. The reason why is that they have several problems. One problem is that the environments that they can live are decreasing. The other is that Japanese giant salamanders cross with Chinese giant salamanders. The reason is that the Japanese giant salamander and Chinese giant salamander have many points of similarity in their DNA. 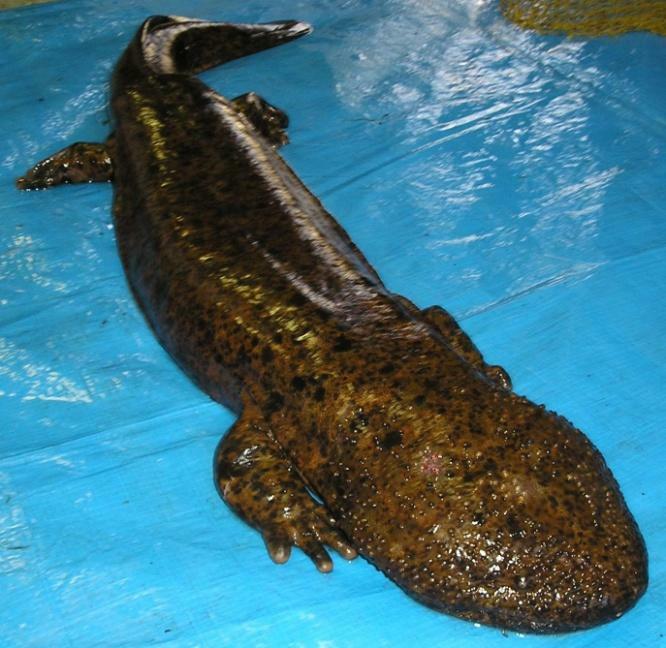 Also, someone transplanted Chinese giant salamanders in Japanese rivers. As a result, we have many problems in protecting Japanese giant salamander. I was surprised at Japanese giant salamanders and Chinese giant saramanders have many points of similarity in their DNA.I think we should know about our living area. I didn’t know thear is Japanese giant saramander in Kochi.And I strprised its appearances have not big changed for about 30,000,000 years.I want see it!